This is how the story of our BAYDUINO project went. “Ideas are cheap. Only execution matters.” This business truism is a mantra, frequently uttered by my co-founder Michael Reuter. And I agree. However, there are two ways from conceiving an idea to executing the project that it entails. The first is the traditional: Go to the workshop, build the prototype, test, and if successful, get orders to build more. The second way, comparably young, is to develop the concept, get a patent, and then find a sweatshop to get your project produced as cheep as possible. The latter became fashionable with companies like Nike in the 1980s; it works of course only if you have global availability of cheap labour and efficient logistics for the goods. The main prerequisite however is that the idea as such can be owned, protected for exclusive exploitation to its inventors. For artisans, securing intellectual property rights from their creation seems as absurd as it would have centuries ago. No carpenter or tailor would be fooled that their customers would buy their work because of its unique originality of its design. The separation of idea and manufacturing came with industrial mass production, when for the first time the designer became a specialized function within the process of manufacturing. Since the design dictated all the products’ properties and how to do them to the manufacturer, the blue collar workers were rendered exchangable. Once designing things was severed from building them, it was almost natural to split the two no longer connected businesses into separate companies. Over the last thirty years, we have seen many branches of the manufacturing industry crumble. Textile, once strong in Germany, is almost totally lost. Worst is electronics. If you want to start something with electronics. it seems almost impossible to do without globally sourcing the components. All concerns, environmental and humanitarian likewise have to be abandoned. When we started working with data, it was obvious that the richest source of data about humans was the so called Internet of Things. More and more devices carry sensors, small instruments that continuously measure all kinds of different values about people’s actions, their surroundings, and even their communication. Some of these devices are fixed, like thermostats or webcams, many are mobile, like the smartphones or wearable accessories. Smartphones in general are by now the most common IoT gadgets. Their sensor measurements range from geo-location to delicate readings of the magnetic fields. However, the operation systems running on the phones hardly allow direct access to these sensors. Hence it remains basically a black box, how the data is generated. The information exists only mediated through Google’s or Apple’s interpretation of the data. One year ago, I visited the beautiful city of Turin in Piedmont for a special occasion: The grand opening of Casa Jasmina at the Fab Lab there (see my report here). Next door to casa Jasmina sits the Officine Arduino. The Arduino (or Genuino respectively) has become the most common platform to prototype for the Internet of Things. It is open source and strongly tied to the maker culture. I am not good in soldering. All educational hardware that I tried, ended in disappointment. In particular, most are way too complicated to just give to the kids; they would fail, too, and then come back to me, hoping I could help them. So I had a strong desire to come up with an easy path into sensor hardware. Also I was convinced that it should be possible to source such a projects locally in Munich, maybe with some help from other parts of Europe. When back home, we discussed my experiences from Turin in our team and decided, that we would start developing. My friend Nils Hitze recommended us to Hans Franke, a hardware expert who turned out to be a total genious. After three month we had our design ready. 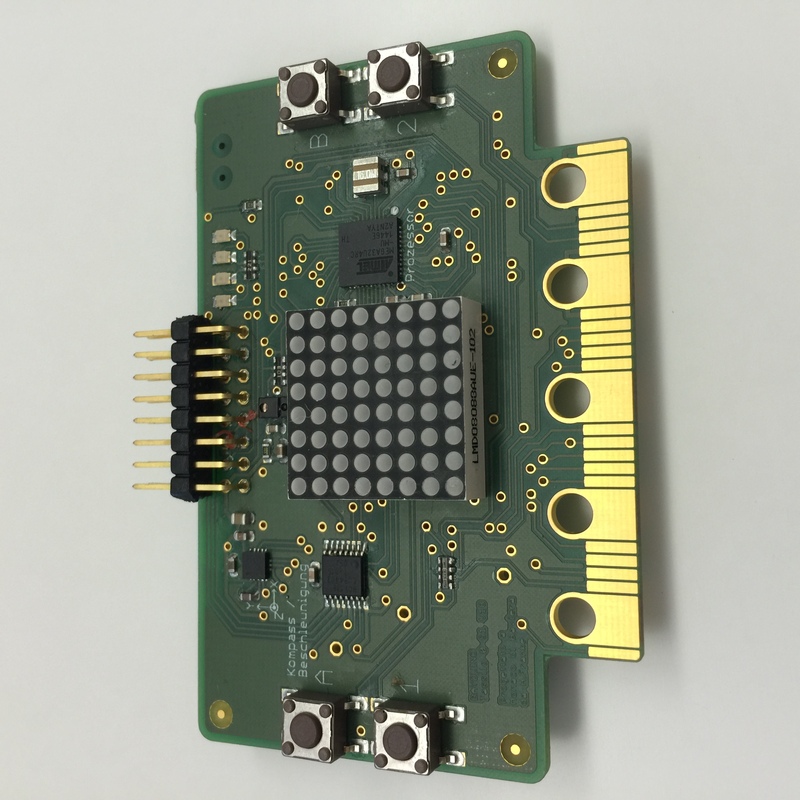 The BAYDUINO is an open source hardware board. 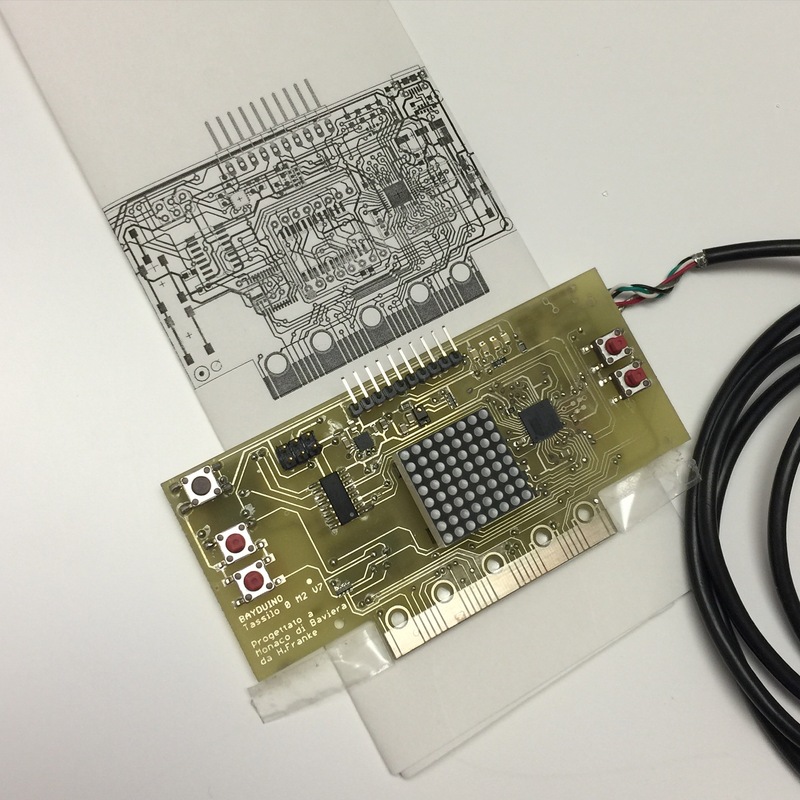 It is compatible to the Arduino as well as the upcoming BBC Micro:Bit. All components come from Europe, most have traveled less than 150 km – with one exception: The CPU which is Chinese. Sadly we were not able to find a local one. The boards are also assembled locally. Just two layers of circuitry, one on each side of the board. Every component would be labeled, so you could not only understand, how all the components are connected, but immediately see, what is what. The board carries various sensors like gyroscope, magnetic field instrument, or photo detectors, and five buttons as controls, has a small LED display and can easily be connected to other actors. 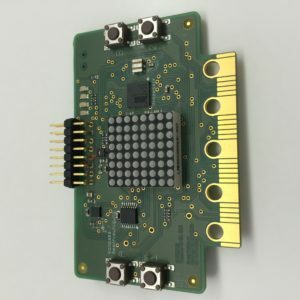 The BAYDUINO has an Open Roberta interface which is developed together with the Roberta team at Fraunhofer Gesellschaft. Open Roberta is a language that lets children to do robotics with small building blocks of code that can be drag-and-dropped on a graphical user interface. This makes programming the BAYDUINO easy even for children who are not skilled in typing. We are also developing mobile apps for this task because many children have smartphones or tablets but no PC. Rapid prototyping and accessible SMT placement shops, great support from the community, and of course the open source knowledge that is available on the net were indispensable help to getting the BAYDUINO accomplished. With our first prototype we started a crowdfunding campaign. And in the next days the first boards will be send out. The BAYDUINO is our idea of Slow Media translated to hardware and the IoT – Slow Technology.